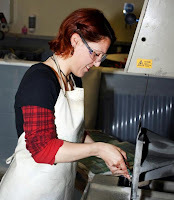 UK glass artist Susan Ratiliff has recently completed her Residency at the Washington Glass School, and we catch up with her for an interview about her experience. Studying Glass at Sunderland University while an amazing opportunity, is driven mainly by the acquisition of skills and knowledge. Work is created to titled assignments until the second semester, where self directed work begins. Even self directed work is overseen and influenced by tutors. By undertaking this residency, I feel it has allowed me to breathe and focus on what I wish to explore and gain confidence in myself as an emerging artist. That is not to say I wish to work in isolation and certainly within the community of artists that work out of the Glass School, artists do seek others perspectives on their work. 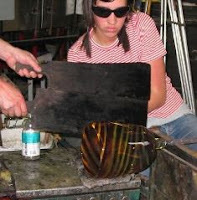 Why did you apply to Washington Glass School specially? 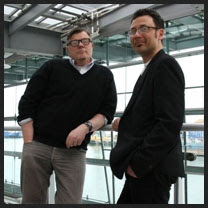 Almost eighteen months ago Michael Janis and Tim Tate, Directors at Washington Glass School were awarded a Fulbright Scholarship and came to Sunderland University where they ran a series of Masterclasses and Seminars. 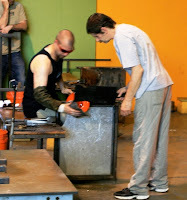 Michael Janis (left) teaching Masterclass in glass at University of Sunderland, 2012. I was fortunate to attend all the Masterclasses and the Seminars. I found the workshops very informative and interesting and was excited by the new techniques shared. More specifically I was very impressed by Michael and Tim – the quality of teaching, preparation and expectations were outstanding. I do not use these words lightly, having been a school’s inspector in my previous career. Their passion and dedication were infectious and I wished I could emulate these traits as an artist. We have had various international artists visit University but these two stood out for me as exceptional. I also felt there was a cultural difference in the attitudes to glass art in America as compared to England. I wanted to learn more, and at all the levels and nuances. All of these factors contributed to me wanting to apply to Washington Glass School. Did the residency live up to the expectations you had? Prior to coming to the US, I was filled with a combination of equal parts nerves and excitement. I wasn’t sure what to expect and didn’t want to let them and myself down.I knew I was prepared to be positive, and to do the best I could and work hard. The residency has certainly exceeded what I had ever envisaged. I have been given so many opportunities and such valuable mentoring that I am shocked that in such a short time, I feel more confident in myself as an artist. I have seen at first hand the diversity of work that exists in a working artist studio, and also the hours that are needed and a glimpse of the challenges to be faced. How did you find the living and studio conditions DC? Did you feel at home? One of the biggest challenges for me had being finding somewhere to live that was both affordable and safe. 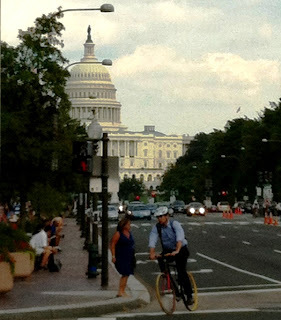 Washington, DC is the capitol of the United States and is an enormous and diverse city. I emailed Michael earlier, asking the specific location of the Glass School as I wanted to look at commuting and not trying to get across the city. From this point I can only say “God bless Google”! I asked how safe certain metro stations were for single white females and got great answers online. I went for a Guest House in Columbia Heightsand it has been fantastic, I feel I am living in a neighborhood, yes there is an energy and a vibrancy but it feels great! It is down the street from interesting shops and restaurants and a DC metro station. I would return to it and recommend it to others too. Susan Ratliff talking with Sean Hennessey; getting studio supplies at Home Depot, enjoying the sweeping compound, and making kilncast glass artwork. On my first day Michael was here to welcome me and began by giving me a tour of the studio. 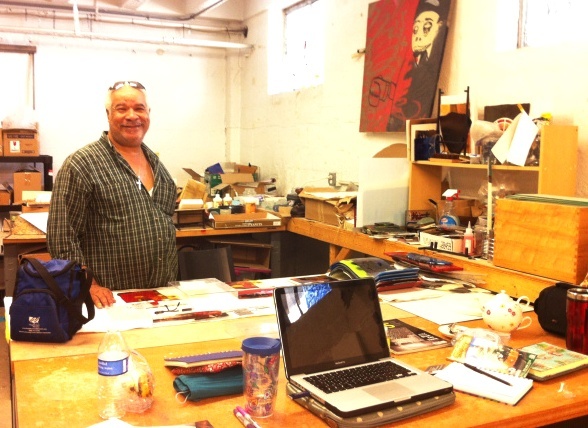 Within the first few minutes he had identified a working space that was designated for me alongside Audrey Wilson, Artist and the Glass School Studio Coordinator and also amongst the other studio artists. This really made me feel very welcome and I hadn’t expected it. Having worked at Sunderland it was lovely to see familiar equipment and the sweetie-like jars of Bullseye frit. One thing new to me was sweeping compound and I am the first to admit I think I got a little too excited by this! Audrey made me feel very welcome,she is very approachable and patient. When practicing skills as simple as glass cutting, she was so encouraging – she enables you to believe you can do it. 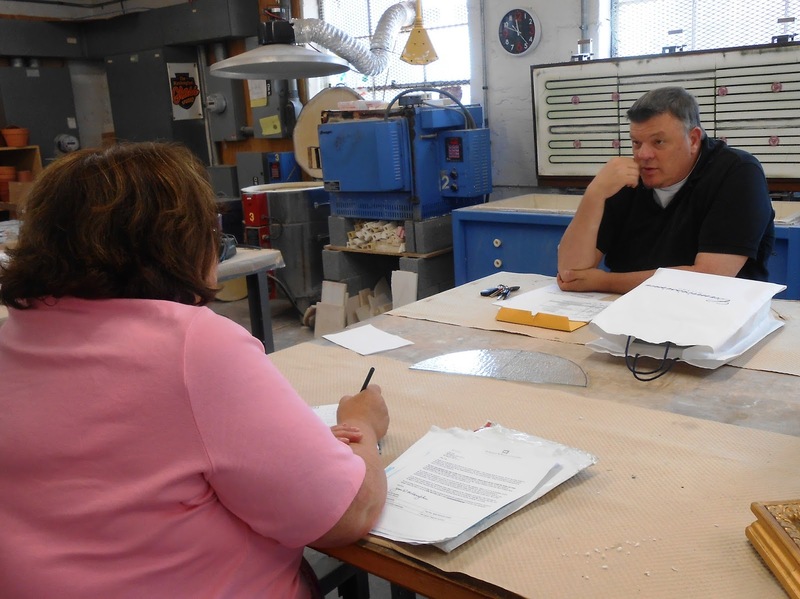 Susan Ratliff and Tim Tate discuss glass art. Tim Tate – who had a very exacting schedule, was preparing to be out of state on an art tour with the Smithsonian’s James Renwick Alliance group, was very generous in giving his time when he was here. And Michael made a point of introducing me to all the artists in the School and encouraged me to inquire and discover more about their work. I found the School very well equipped and well resourced. It has seven kilns of various sizes, cold shop and mold making areas, as well as some metal work facilities too. I think it is extremely well resourced. My days were varied but generally we began the day at 9:30 and worked through till after 5:00. Audrey Wilson and Susan Ratliff make the 2013 International DC Short Film Festival Awards. 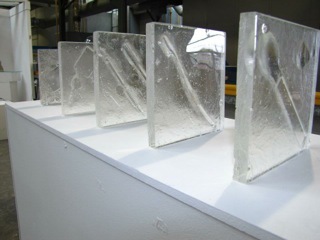 Some of the studio tasks included assisting Audrey in making the glass awards for the DC International Short Film Festival. 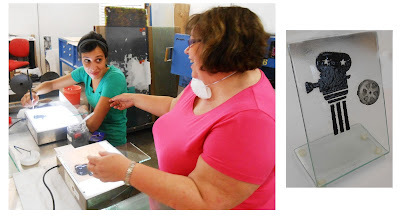 Cutting glass, cleaning out kilns and talking to artists about their work. Making my own work. Going to Galleries, Museum exhibitions and lectures. Learning to blog and be a photographic model….I felt these last two weren’t my strengths. Susan was able to take advantage of the different museums, and loved the National Gallery of Art. On a studio-based day, I would generally start by asking Audrey if she had any tasks. If not, I would update my blog and then talk to one of the resident artists, including artists from some of the adjacent ceramic studios, about their work. Susan works at the dry plaster casting technique to create some glass studies. Following on from this and after a quick bite of lunch, I would work on a piece of my work to go into the kiln. While here I have been working on the Dry Plaster Technique for kilnforming glass, following on from the Fulbright Masterclass in Sunderland. On days when my work was out of the kiln in the morning, I would take it out and prepare the kiln in case anyone else needed it. How did you make use of the facilities? Our final year is a self directed module and so I to the opportunity to make a start on exploring an artwork idea that I had. 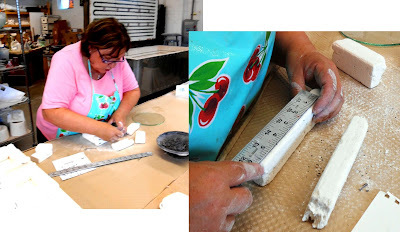 I was assigned a kiln to use for work and carried out several test pieces exploring size, color and shape,all of my work was using dry plaster casting. Susan’s workspace is covered with glass components made during her residency. It was excellent to have the time to experiment, it felt quite liberating! 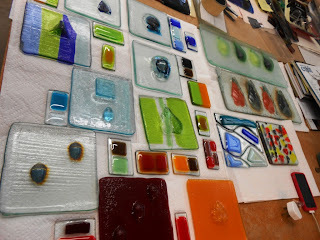 I used 1/4 inch window glass and various colored frit and colored plate glass. I made the dams, sifted the plaster, cut the glass and used various found objects -some were more successful than others, but that is the nature of testing and the beauty of glass. Susan notes that the USA has still not switched to metric, and must measure in imperial. Do you get feedback on your work during studio visits? I got excellent feedback throughout the process. Whilst setting up the kiln Michael would come over and ask questions such as Why are you doing……? What do you expect to happen if ……? The whole process made me think much more. When the work came out we would talk about the technical aspects what had worked well what not so well and happy accidents! I also felt I really benefited from discussions about my concept for my work. It is the first time I have felt mentored and found it invaluable and something I hope could continue. Would you like to stay in DC after you’ve finished? 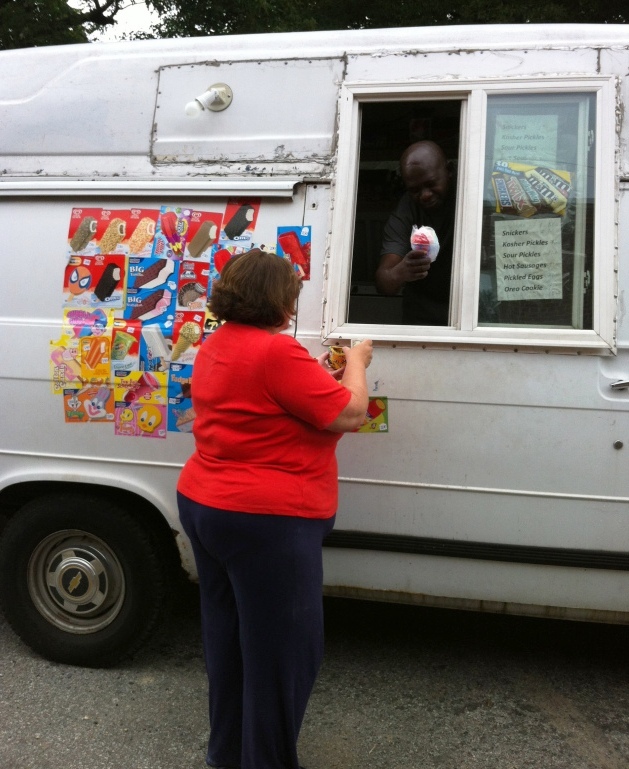 The ice cream truck arrives in time. The first reaction is yes! I feel I have gained so much more from the whole experience. On a management course once a speaker described that often we live our lives holding a beach ball in front of us, and only seeing the world from that angle, and we should appreciate other people have a totally different view to us. I think coming here has given me a very different view. The way I have seen artists approach the work here in America is different to what I am used to, and sometimes feel that history and tradition really influences how people think – and I wanted to challenge myself by developing other methods and processes. Luckily, I had got a grant from the University that helped offset some of the costs in doing the residency. I am very lucky to have American friends that live in the neighboring state of Virginia, so knew they would support me and they did. Collecting me from the airport and having me on the weekends as well as providing me with food parcels – as though there were no food stores in the city of Washington! My friends and I were able to pop up to New York for a weekend escapade and took in a Broadway show before coming straight back to work at the studio. Bright lights, Broadway, Big City – Susan felt like she was in an alternate world. 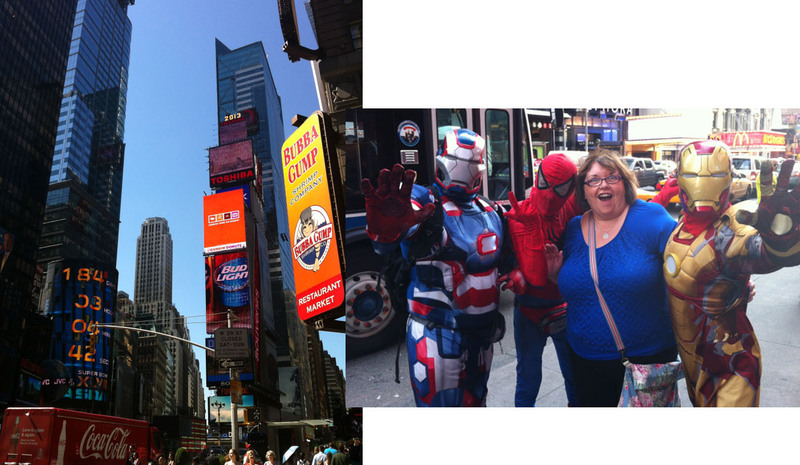 I have loved it and would love to return……the question is, Would they have me back?! UK Glass Artist Susan Ratliff is overwhelmed by the Americanness of it all. Forget all the kerfuffle about the newest UK arrival at Buckingham Palace. The Washington Glass School has its own UK arrival – University of Sunderland artist Susan Ratliff has begun her artist residency thru August. Susan is about to begin third year as an undergraduate in Glass and Ceramics at Sunderland University. Susan came to glass after a career in the field of Special Educational Needs – both as a teacher and as a Head of Service. 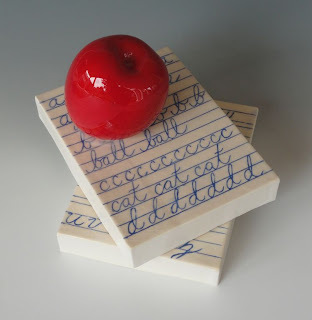 Susan Ratliff, “Can You Remember” sandcast glass. The series of cast panels references loss of memory caused by Alzheimer’s disease. Michael Janis discusses sgraffito techniques with Susan Ratliff at University of Sunderland, 2012. 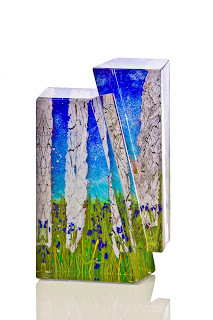 Susan Ratliff, “Landscape”, kilncast glass, mirrors. The 1st year presentation dealt with self image and identity. Susan had incorporated dry plaster casting techniques for the installation piece. If you are coming to the studio – make sure you stop by and say “Hi” to Susan, and make the Brit feel at home! The UK’s National Glass Centre at the University of Sunderland reopens its doors this weekend (June 29/30 2013) following an ambitious £2.3m ($3.5 USD) redevelopment program. The Centre is one of the UK’s leading institutions for contemporary glass, celebrating Sunderland’s unique glass-making heritage, presenting a rich temporary exhibition program and facilitating international level research in new approaches to glass and ceramics. This ambitious redevelopment project will allow National Glass Centre to fulfill its potential as a cultural and education venue. The Glass Centre houses the University of Sunderland’s Glass and Ceramics Department, the International Institute of Research in Glass and the Ceramic Arts Research Centre at the University of Sunderland. The Research Gallery space will allow the Centre to showcase some of its groundbreaking work in research carried out by its students, academics and visiting artists. The redevelopment sees a complete overhaul of the Centre’s exhibition spaces and will allow the Centre to present work by the highest caliber artists and to work in partnership with international museums and galleries. The Centre will host three major exhibitions annually and up to 15 smaller scale exhibitions in the new gallery spaces, we will also have a ‘rotating museum’ which will present a selection of high profile glass and ceramics collections on a yearly basis. 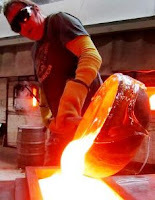 Last year, Washington Glass School’s Tim Tate and Michael Janis completed their Fulbright Scholar assignment at the University of Sunderland and taught at the National Glass Centre. Click HERE to jump to the University of Sunderland news article. 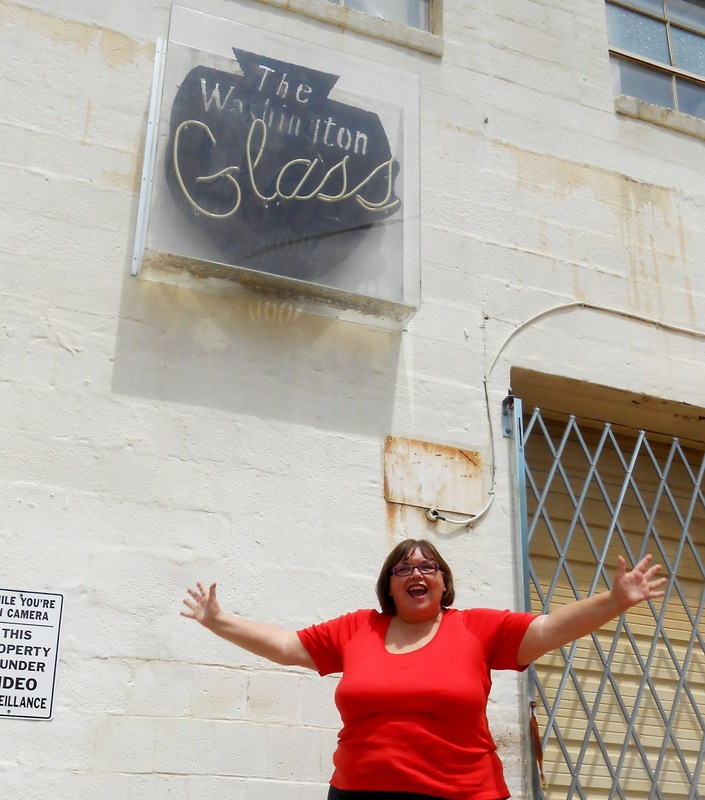 All of us here at the Washington Glass School are excited to see the ambitious redevelopement and wish it great success as it enters into a new era! We all agree – Glass Is More! International Glass & Clay 2013 Opens! This weekend, the opening reception for the International Glass & Clay 2013 was a great sucess! The collaborative show, organized by Artomatic, the Office of the Secretary of the District of Columbia and DC’s Sister City of Sunderland, England and the University of Sunderland had a great turnout for the first night of the month long event. A number of the UK artists exhibiting in the show were on hand at the opening, and they were able to make connections with collectors and the DC creative community. Colin Rennie talks about his process and influences. Washington DC collectors contemplate Megan Randall’s ceramic works. Stephen Beardsell’s glass sculptures are always a favorite. 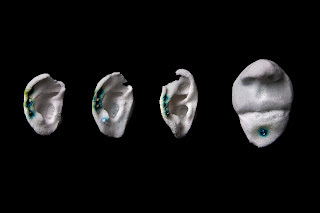 UK glass artist Robyn Townsend answers questions about her glass artworks on exhibit. 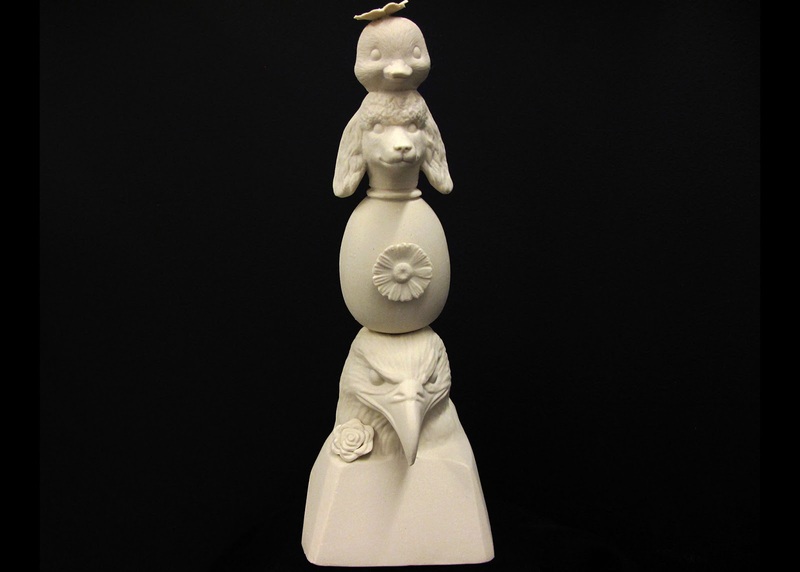 Beautiful ceramic sculptures by Novie Trump. Glass artwork by UK glass artist Jeffrey Sarmiento and beyond, works by US artists Nancy Donnelly and Audrey Wilson. UK glass artist Phil Vickery chats with DC collectors. 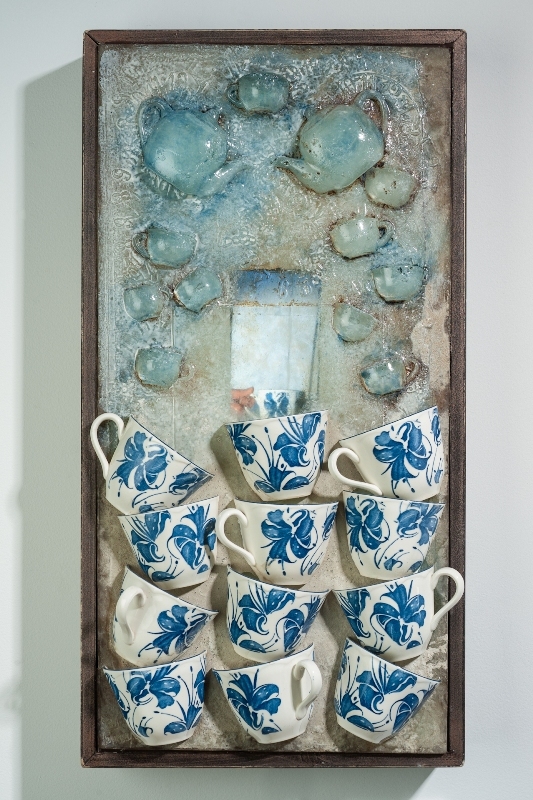 Artwork by UK glass artist Criss Chaney and ceramic work by US artist Tamara Laird. 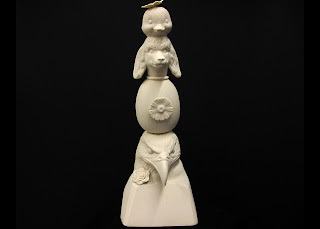 Ceramic sculpture by the UK’s Philippa Whiteside. 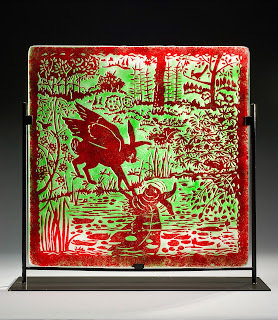 UK glass artist Roger Tye expresses surprise at what artist Criss Cheney has to say. Sunderland City International Manager Catherine Auld is happy as Sunderland’s Anne Tye negotiates a sale with a Washington, DC art collector. The international exhibit will be open to the public thru March 23, 2013. 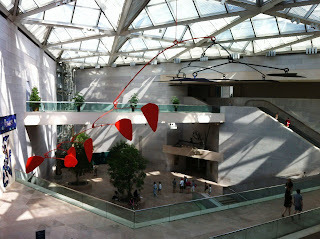 Location is Pepco Edison Place Gallery, 702 8th Street, NW, Washington, DC 20068. Gallery hours Saturday & Tuesday 12pm-4pm. Wednesday, Thursday & Friday, 12pm-8pm. Click HERE to jump to the exhibit website for more info on special events and artist info. Using an art exhibition as a bridge between countries, Artomatic, the DCCAH, the City of Sunderland, England and the UK National Glass Center have collaborated to bring together the Sister Cities of Sunderland, England and Washington, DC in a show that celebrates the medias of glass and clay, as well as celebrating the relationships between the two cities. We are pleased to invite you to attend the opening reception of the International Glass and Clay 2013, on Friday evening, March 1 from 5:30-8pm, hosted at the Pepco Edison Place Gallery in downtown Washington, D.C.
Visit our special website for more information about the exhibition http://glassandclay.org/ - There are planned events during the show, including demos, roundtable discussions, wine tastings and more! Opening March 1, 2013, Washington, DC will host an international exhibit of glass and clay artwork – the third collaborative exhibition organized by Artomatic and the DCCAH between Washington, DC artists and artists from our Sister City of Sunderland, England. With all the amazing glass and ceramic artwork being showcased, Washington Glass School will publish online a five part series of profiles on the artists behind the works. US & UK Artists in the International Glass + Clay 2013 Exhibition in Washington, DC. Laurel is a founding member of Flux Studios, in Mt. 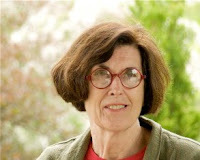 Rainier, MD and has been a visiting artist at Seattle’s Pottery Northwest and Holland Hall in Tulsa, OK. She has served on a number of nonprofit boards including the Washington Sculptors Group, the National Cherry Blossom Festival and the Washington Project for the Arts Artist Council. 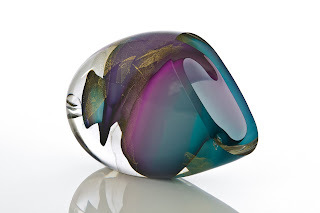 Roger Tye has been making glass since 1976, initially as Master production maker for the studios of Pauline Solven and Charlie Meaker, before setting up his own full time practice in 1989.Roger now concentrates on sculptural works. 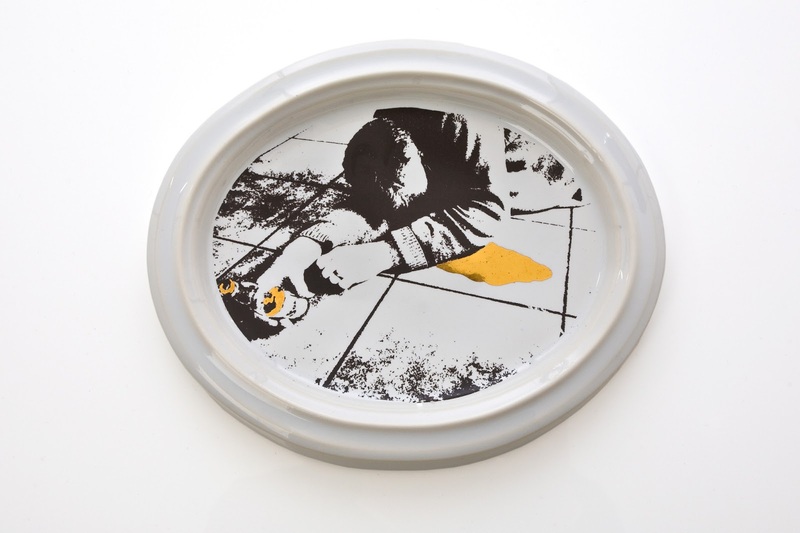 His most recent body of work also combines glass with slate and metal and offers wry observations of social events and situations. 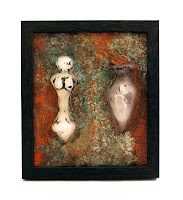 He has exhibited and throughout the UK and internationally to 28 countries and his work is in the collections that include Shell, British American Tobacco, American Airlines and the Royal Family. 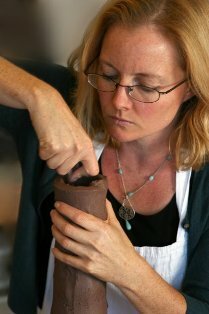 Elizabeth Vorlicek is a ceramic sculptor and visual arts teacher living in Alexandria, Virginia. 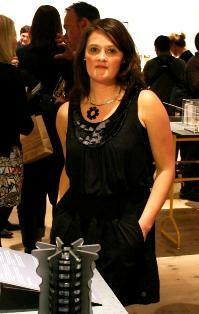 She graduated from the New York State College of Ceramics at Alfred University with a BFA and a MFA degree. 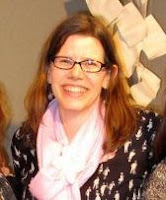 Liz has taught in the Arts Department at Episcopal High School in Virginia for the past seven years. 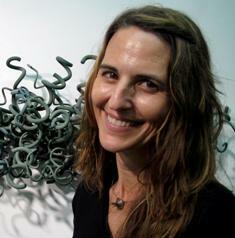 She is also a curator and the Director of the Angie Newman Johnson Gallery. Liz joined Flux Studios in Mt. 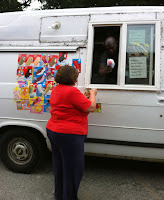 Rainier, Maryland as an Emerging Artist in the fall of 2012. She enjoys traveling, bird watching and baking in her spare time. Megan Randall is a contemporary ceramic artist, and is a current PhD student a Sunderland University where her research focuses on the placement of domestic ceramic objects responding to the context of site. Her work makes use of thrown porcelain alongside other less traditional materials and found objects. Working on the wheel is repetitive this gives pieces a rhythm and flow. Recent work has focused on willow pattern designs, which create their own narrative around domestic spaces, industrial sites and the notions of home. In the past her work has included site specific installation and interventions alongside designed and hand crafted ceramic objects. 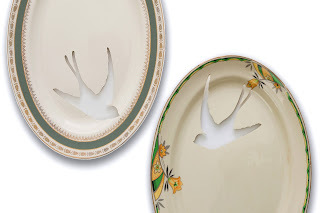 The link between the separate worlds of fine art concept and that of designer/maker is the consistent use of porcelain which evokes a sense of luxury, fragility and, in some pieces, vulnerability. 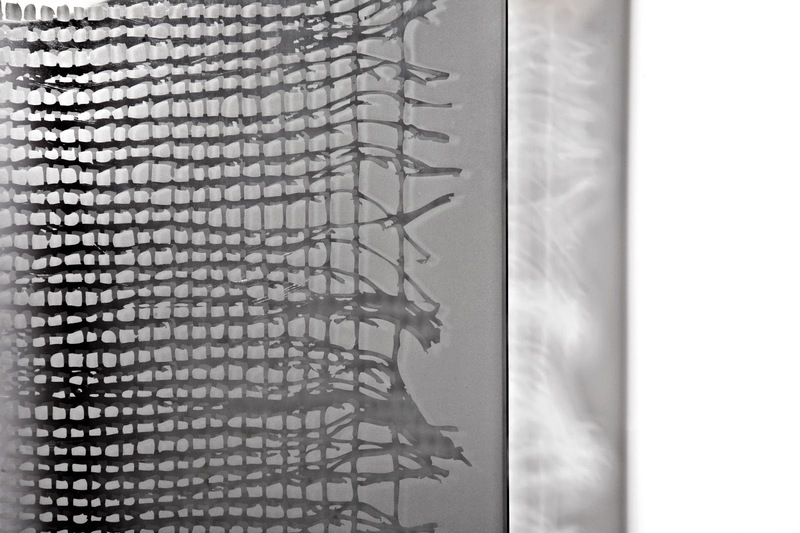 Her work combines new technology through the use of the waterjet cutter with the altering of the readymade object. There will be a “Day of Demos” by a number of the visiting UK artists – Saturday, March 2, 2013. 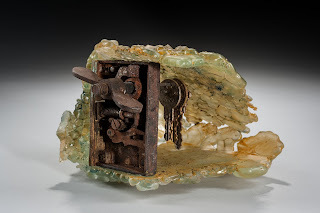 11:00 AM at the Washington Glass School, UK-based glass artists Criss Chaney and Robyn Townsend will demonstrate using metal wire and sheet inclusions into cast glass, and painting a layer of metal powders onto the inside mould surface. They will also demonstrate cold techniques for applying metals to a finished piece of glass, and options for patination using common household chemicals. Click HERE to reserve a space at this free demo. 2:00 PM at DC GlassWorks, superstar UK hot glass artists Phil Vickery, Colin Rennie and Roger Tye will show how they work. Click HERE to reserve a space at the free demo. 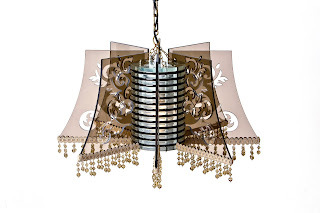 Inge Panneels has been designing and making architectural or sculptural glass pieces since 1998. Inspiration for her work is driven by location and circumstance and life’s rich tapestry a recurrent theme. Inge is originally from Belgium now lives and works in the Scottish Borders but works throughout the UK. 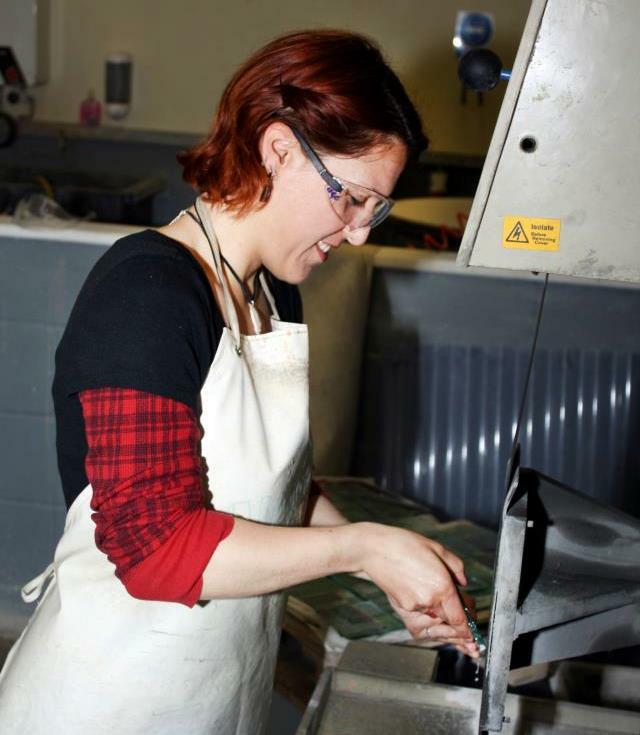 Inge also lectures part time at the Glass and Ceramics Department of the University of Sunderland. A body of sculptural work exploring mapping is emerging; such as “Liverpool Map (2011) commission for the Museum of Liverpool, with new work being developed inspired by residencies at Mercator Museum (Belgium) and Jedburgh Abbey in 2012, to be completed in 2013. 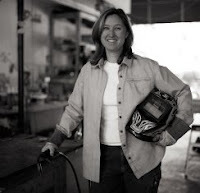 Nancy Donnelly is a studio artist at the Washington Glass School. 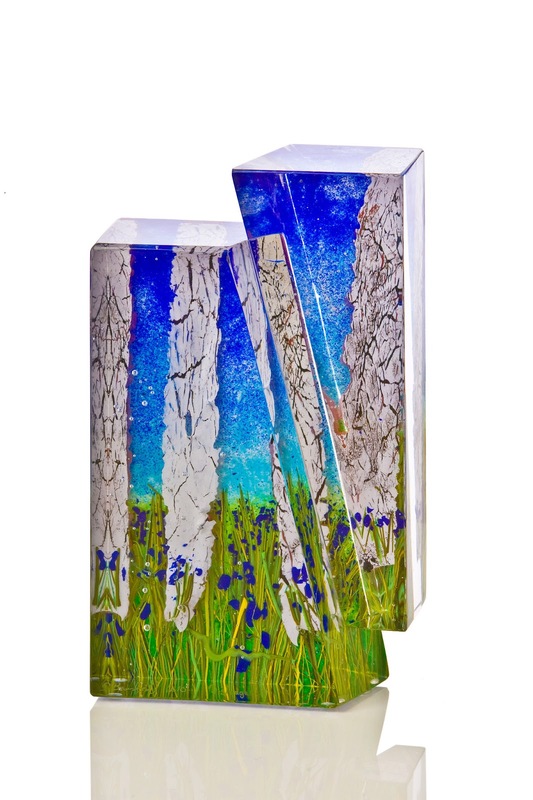 She makes 2- and 3-dimensional art glass using color and imagery drawn from her painter’s training. Her work can be seen at Foundry Gallery and elsewhere in the Washington area. 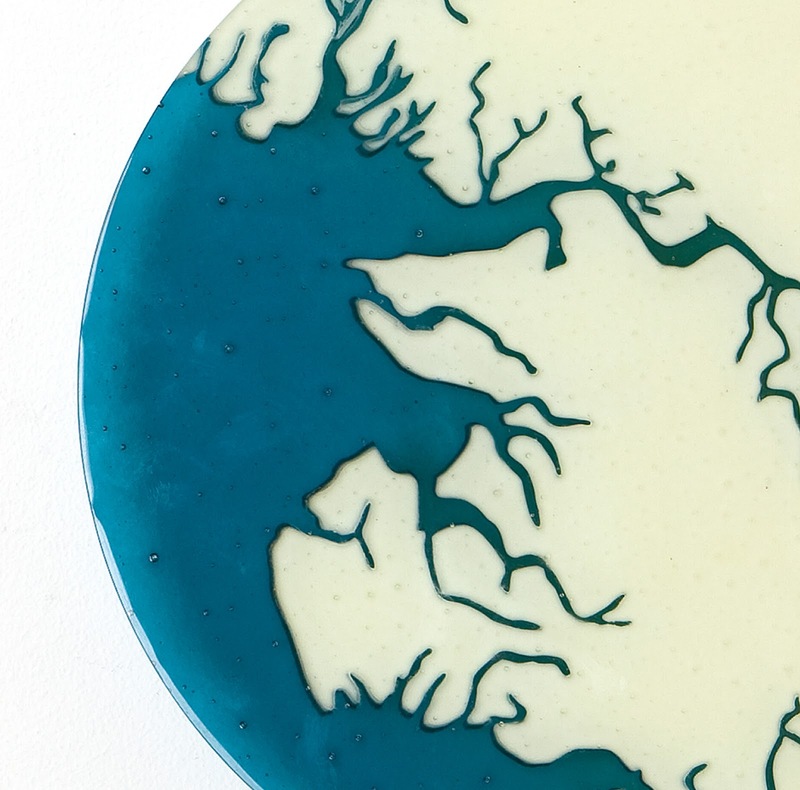 Philippa Whiteside graduated from Sunderland University in 2010 with a BA Hons in Glass and Ceramics. 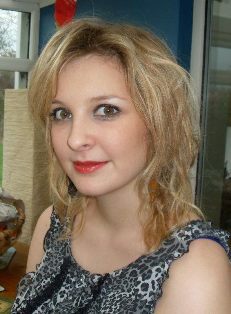 She was awarded a 12 month scholarship with Creative Cohesion, supported by Sunderland City Council. 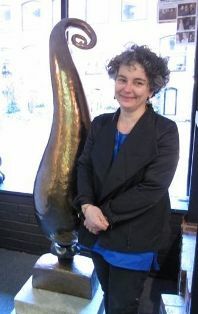 In May 2011, Philippa was elected Director of Creative Cohesion where she now runs her ceramic studio. Philippa expores her fascination with lettering and words, and often combines ceramics with textile decoration and texture. 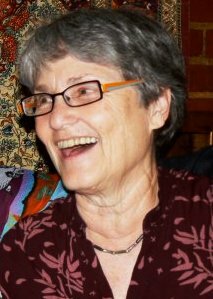 Allegra Marquart came to Baltimore, Maryland in 1976 to teach printmaking at the Maryland Institute College of Art (MICA). Gradually she became recognized for her narrative imagery that revolves around the joys, absurdities and surprises of human experience. 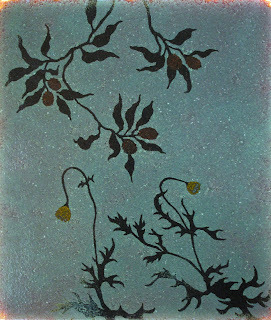 Her prints are held in collections including the Zimmerli Art Museum, the Baltimore Museum of Art, the Philadelphia Museum of Art and the Huntsville Museum of Art. In 2001 she began to explore the possibilities of realizing her images in glass. 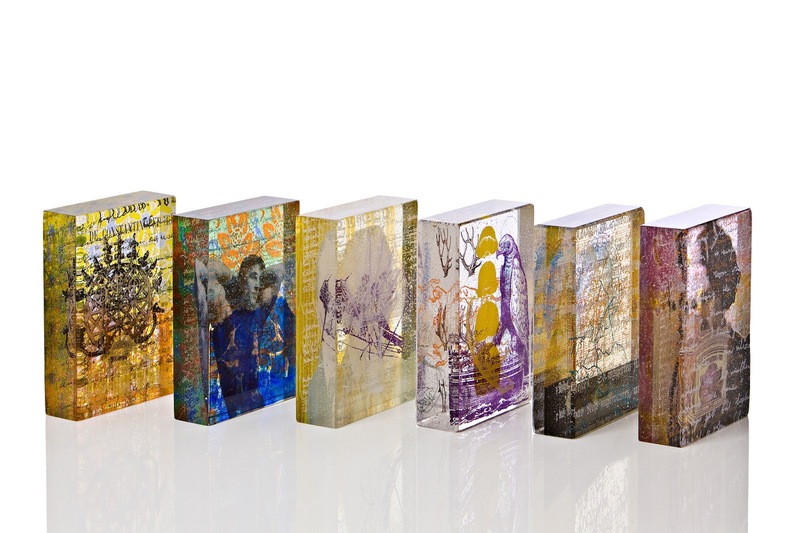 Allegra began interpreting old stories and intricately rendering them on colorful glass panels. 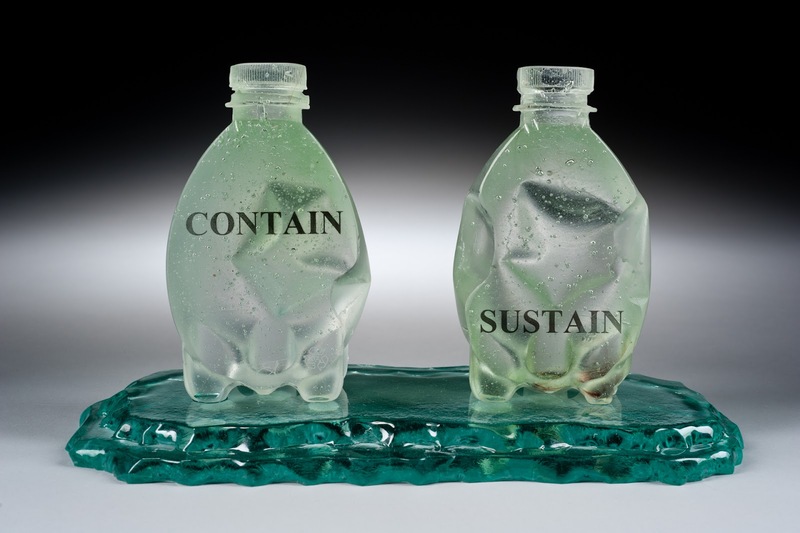 Her glass work was represented in a recent contemporary glass art exhibition at the Museum of American Glass at Wheaton Arts. 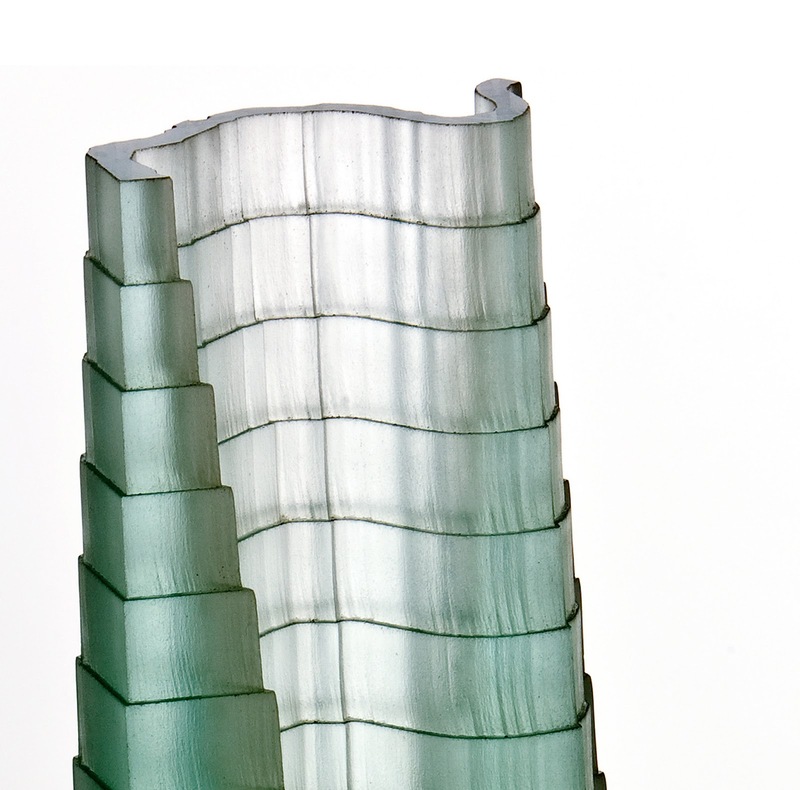 One of her glass towers is also in the collection of the National Institute of Health in DC. Stephen Beardsell graduated from the University of Sunderland achieving an MA in glass 2006 and BA in glass and ceramics 2001. 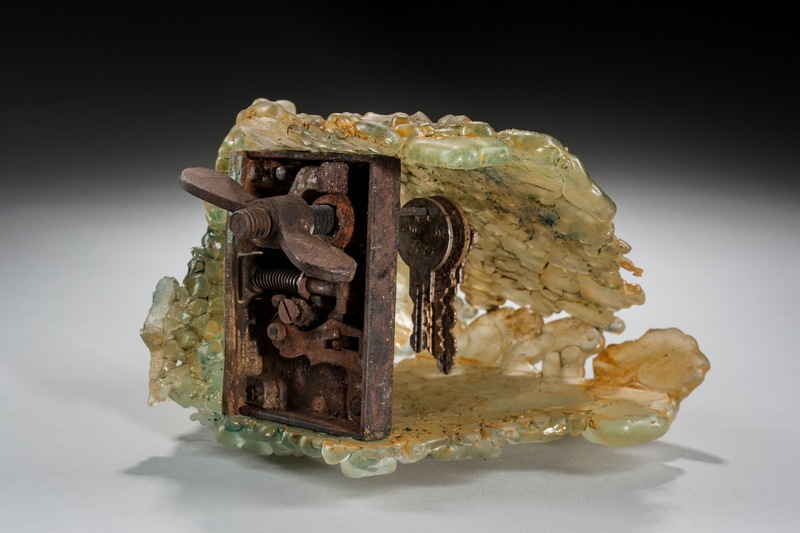 Working in sculpture for the past 17 years, Stephen creates mixed media sculptures that sit comfortably in the natural environment without conflicting with their immediate surroundings. Stephen crafts his glass artwork employing many techniques, including blown glass, hot sculpting, and hot casting into sand or graphite moulds, kiln form glass. He recently kiln cast the largest singular piece of glass in the UK – a large oval red lens weighing 350kg (770 lbs), cast in a Czech glass. Ani Kasten has been working in the ceramic medium since 2000, beginning with an apprenticeship with British ceramist Rupert Spira. After a year in England, Ani traveled to Kathmandu, Nepal where she spent four years as head of a project for developing stoneware technology for a community of artisan potters in the village of Thimi. Her training in England and the exotic working environment in Nepal have infused Ani’s sculptural vessels with a combined aesthetic, drawing on minimalist British studio ceramics, as well as ancient, weathered, hand-made objects born from traditional cultures throughout Asia. After leaving Nepal, Ani began working in Oakland, California where the fresh natural beauty of the California coastline juxtaposed with extreme urban deterioration began to inform the language of her work. From 2007 through 2009, Ani was an Artist in Residence at Red Dirt Studio in Mt. 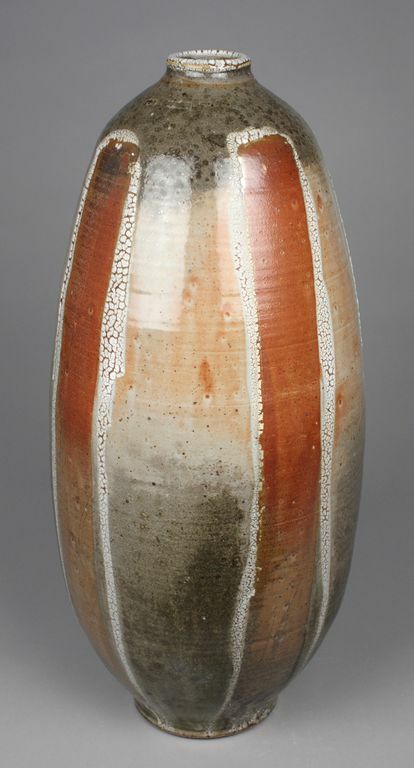 Rainier, MD, where she worked closely with ceramic artist Margaret Boozer, and further developed her distinct combination of sculpture and vessel work, showing her ceramics nationally at galleries and craft shows. 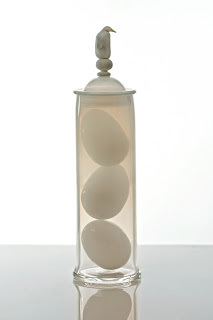 David D’Orio has a BFA in sculpture from the University of Hartford and has worked in glass for over 15 years. 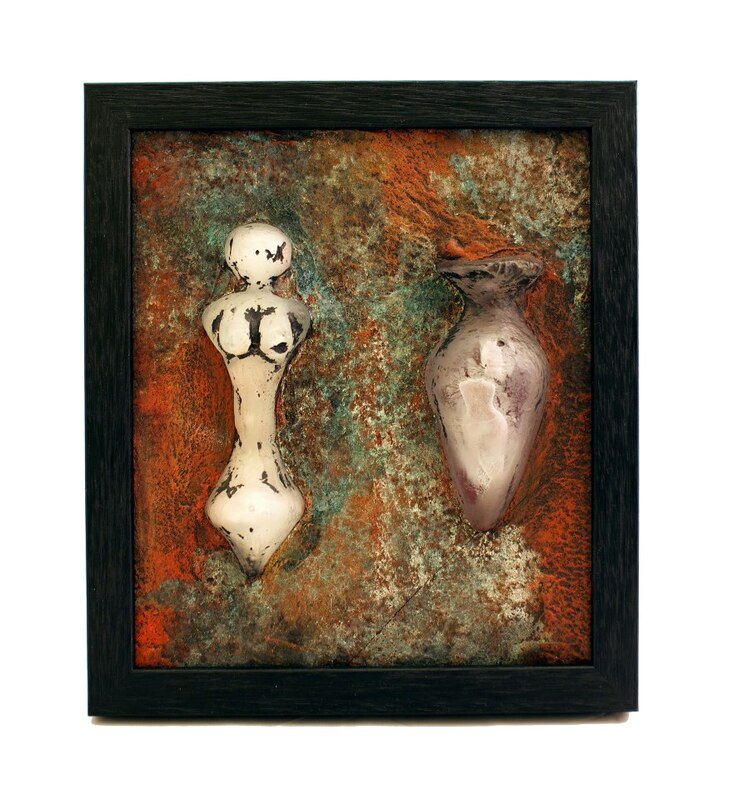 His artwork features mixed media, glass and steel. 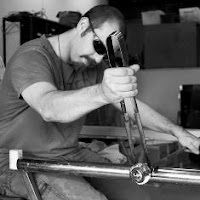 Dave is Director of DC GlassWorks, one of the DC area’s premier public access hot glass shop, located in Hyattsville, MD. His work has been shown at Artomatic in Crystal City, the Marlboro Gallery of Prince George’s Community College and last year was part of the Arlington Arts Center Solos. At this past Artomatic Art Fair, the James Renwick Alliance gave Dave’s installation sculpture its ‘Award of Recognition’. 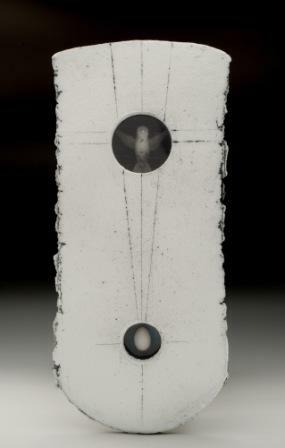 David was awarded second place in the 2012 Trawick Art Prize. 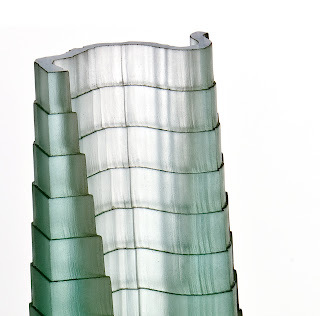 Michael Janis developed a focus on kiln-glass after working for twenty years as an architect in the United States and Australia. 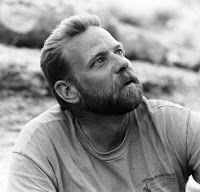 Now Co-director of the Washington Glass School, Michael has taught at the Penland School of Crafts, California’s Bay Area Glass Institute, and The Glass Furnace (Istanbul, Turkey). His work has been shown at major galleries and art fairs and is included in the permanent collection of the Art Institute of Chicago. 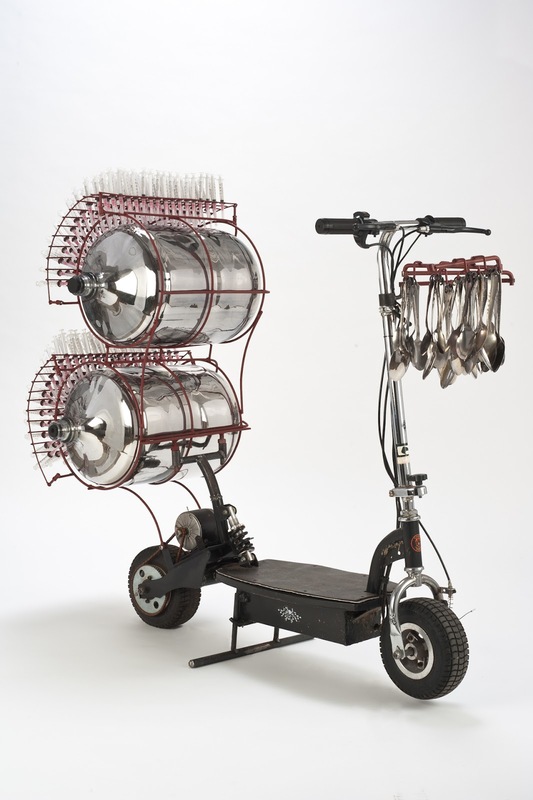 In 2011, Michael mounted a solo exhibition at the Fuller Craft Museum (Massachusetts). 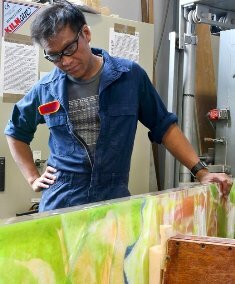 His work was featured in Corning Museum of Glass publication ‘New Glass Review’, and he was named a “Rising Star” by the Creative Glass Center of America. 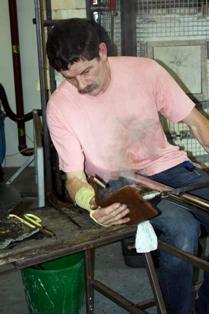 In 2012, awarded a Fulbright Scholarship, Michael went to the UK’s University of Sunderland and National Glass Centre. He was an Artist-in-Residence at the Institute for International Glass Research (IIRG). American Craft Magazine will have an 8-page profile of Michael and his work in the 2013 April/May issue. 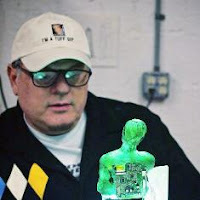 Criss Chaney is an internationally recognized glass artist, who has exhibited extensively in the UK, Europe, and the United States. Including a solo exhibition at the Museum Humanum in Austria. 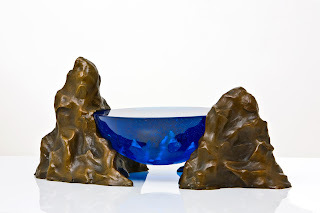 For years she has been developing techniques for combining glass and metals, exploiting methods for working with both materials. 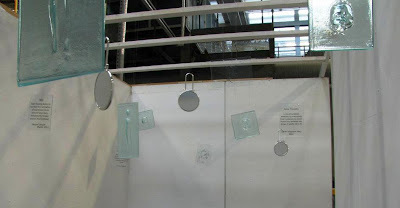 Her pieces make people question their views on glass and push the boundaries between glass and other media. She now makes her work at Creative Cohesion in Sunderland, where she has recently completed a large public art commission. 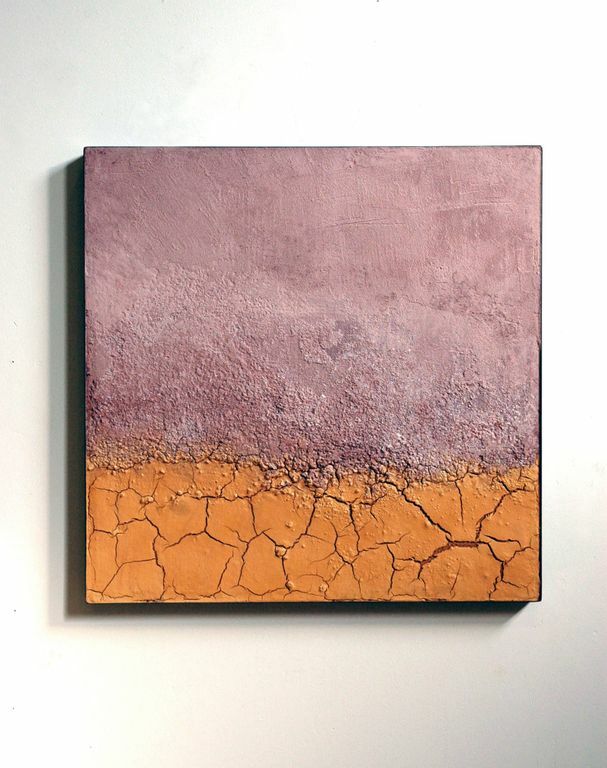 Criss’ work is about the human experience, spirituality and the subconscious. Sean Hennessey is a mixed media artist based in Washington, DC. 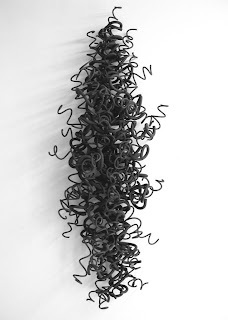 Working in glass, concrete, steel, light and video, Sean creates imaginative wall relief works inspired by architectural sculpture and drawing narrative content from philosophical, mythological, historical and personal interpretations. 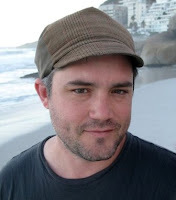 Sean has received fellowships with the city of the District of Columbia, an award of Craft Excellence from the James Renwick Alliance, and is in the collection of the US State Department Art in Embassies Program. His work has been seen on the Discovery Channel, National Geographic, HGTV, The Kennedy Center and at Aqua Art Miami. 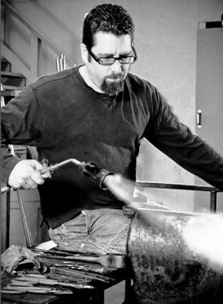 Sean is currently a Resident Artist at the Washington Glass School. 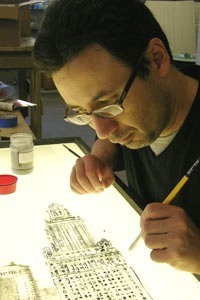 James Maskrey started working with glass in 1990. He originally trained as an apprentice and subsequently worked for 7 years at a hot glass studio in Dorset, in South West England. He left to study glass at The Surrey Institute of Art and Design, graduating in June 2000. After graduation he was appointed as Artist in Residence at the Surrey Institute. In 2001 James joined the Glass and Ceramics department at The University of Sunderland, where he graduated with an MA in Glass with distinction in 2004. 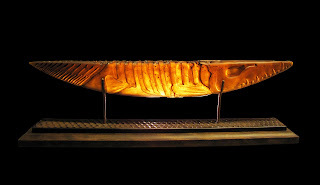 His work is held in many collections including The Crafts Council, Dan Klein and Alan J.Poole (National Museum of Scotland), Perth Museum and Art Gallery, Northlands Creative Glass, The Captain Cook Memorial Museum, Manchester Metropolitan University special collection and Crystallex (Czech Republic). He has exhibited widely in the UK, in the USA and at the International Glass Symposium in the Czech Republic. 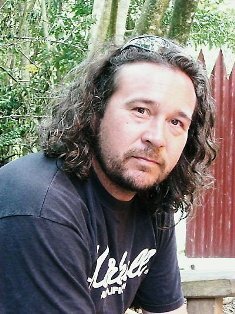 Joe Hicks has been living in Washington DC where he moved after receiving a BA in Art from Shippensburg University in 2000. 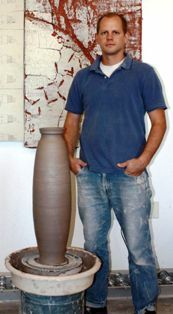 He enrolled at The George Washington University where he studied for three years earning his MFA in Ceramics in 2005. 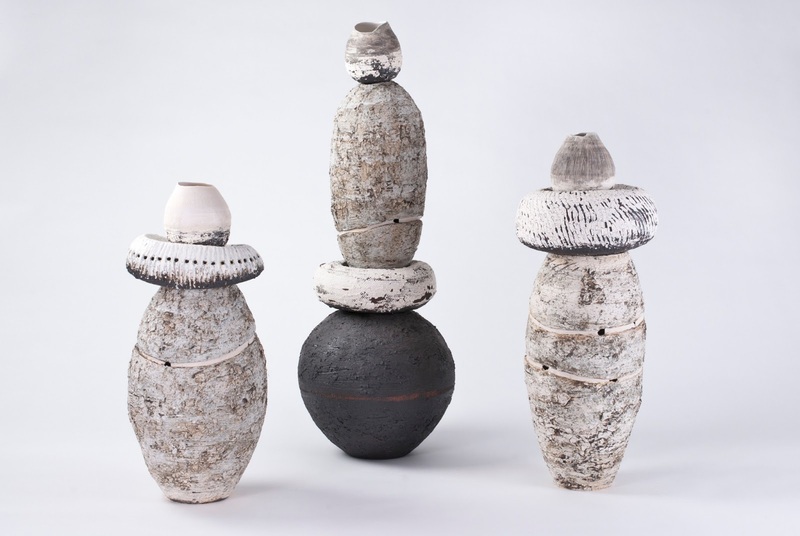 Joe Hicks currently maintains a studio for his own ceramic vessels and sculpture work, participating in ceramic and sculptural exhibitions on the regional and national level. He directs the ceramic program at Gallaudet University and is an Adjunct Professor of ceramics at The George Washington University. Dr Margareth Troli is based at the National Glass Centre (UK) in Sunderland where she explores the integration of digital technologies in her artwork. 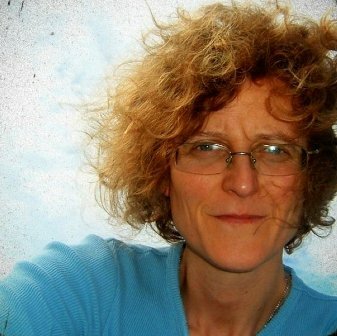 She completed a Phd in 2011 with the support from the Art and Humanities Research Council (AHRC). 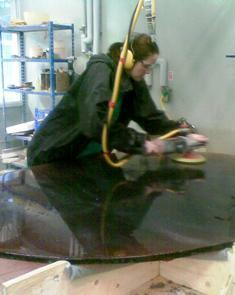 She developed technical approaches for the Studio Glass through the investigation of waterjet cutting. Margareth’s research has also been presented at international conferences, and she has received numerous prizes, awards and scholarships for her artwork. 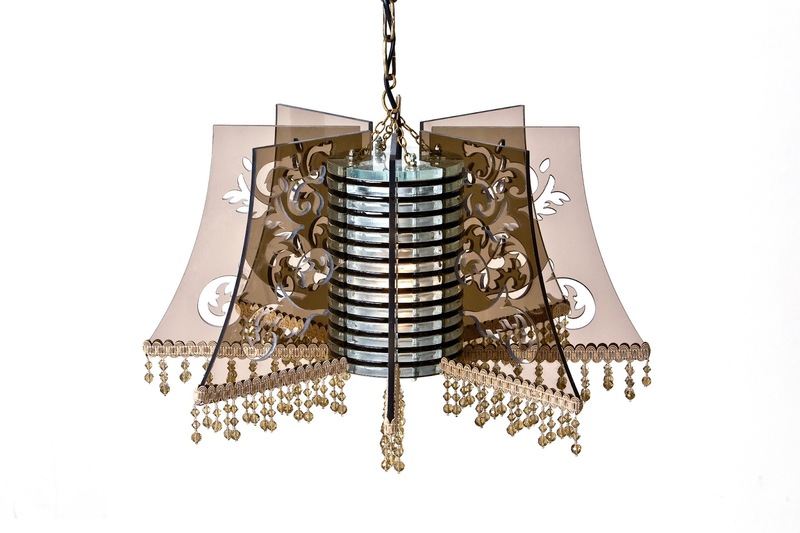 Margareth has participated in several international exhibitions and design fairs such as the British Glass Biennale (UK,) 100% Design, (UK), SOFA New York, Designers Block, (UK), Coburger Glass Prize Exhibition, (DE), Design Mart (UK) and The British Parliament. 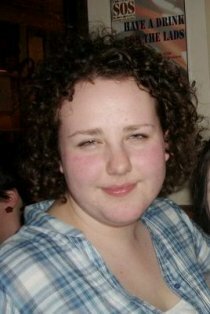 Tamara Laird has a wide range of experience, teaching and studying internationally. In 1985 she moved to Nairobi Kenya, where she worked at the National Museums of Kenya on a United Nations Preservation project for the Island Community of Lamu, and as Professor of Art [Ceramics] at Kenyatta University. In 1994, Tamara relocated to Bangkok, Thailand, where she carried out extensive research, visiting individual artists, traditional village production practices, and full-scale industrial ceramic factories. Sponsored by the Thai Government, Tamara joined an educational tour of Industrial Production Facilities. Tamara has also traveled through Mexico, documenting production methods that integrate traditional and contemporary industrial production. Her frequent travel throughout Italy, researching Italian Majolica from Deruta in the north to Vietri in the south, continues a life long habit of documentation, focusing on connections between local culture, artistic development and traditional practice. These experiences have been integrated into her teaching practice, bringing universal craft education practice to the classroom. Syl Mathis has been with the Washington Glass School from its first “glass and steel” workshop. 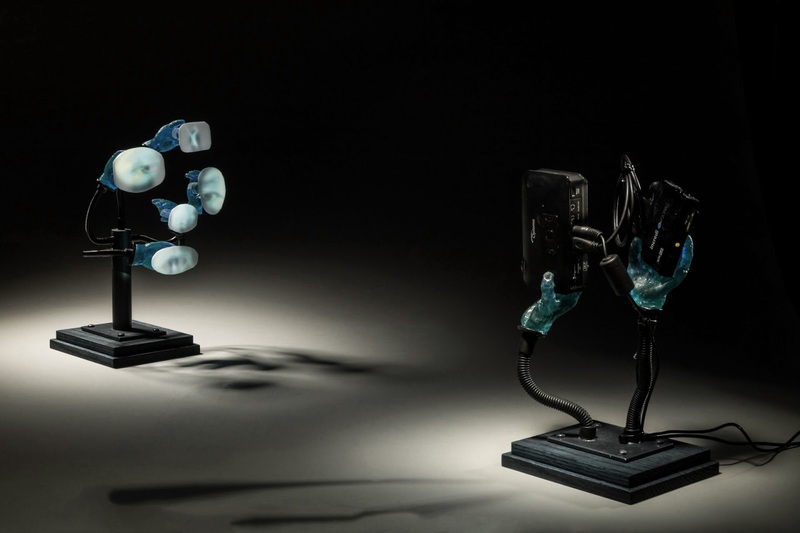 Self-taught as a glass carver, Syl combines investment casting techniques, high pressure abrasive carving, and cold-working techniques to create sculptural pieces in glass that often reflect stylized natural artifacts. His imaginative and skillful use of design–designs which are combinations of man-made and natural forces–not only reflects a love of Nature which invites meditation and thoughtfulness, but also, eloquently highlights the beauty of Nature’s own patterns with a precision that transcends the mere manipulation of tools or careful, mechanical dexterity. As a professional educator, Syl is a firm believer in process, the process of creative expression and of learning; as such, each carving is both a piece of art and the first step in a journey that promises to deepen our perception of Nature. 11:00 AM at the Washington Glass School, UK-based glass artists Criss Chaney and Robyn Townsend will demonstrate their techniques for combining glass and metals, exploiting methods for working with both materials. Click HERE to reserve a space at this free demo. 2:00 PM at DC GlassWorks, UK hot glass artists Phil Vickery, Colin Rennie and Roger Tye will show how they work. Click HERE to reserve a space at the free demo. 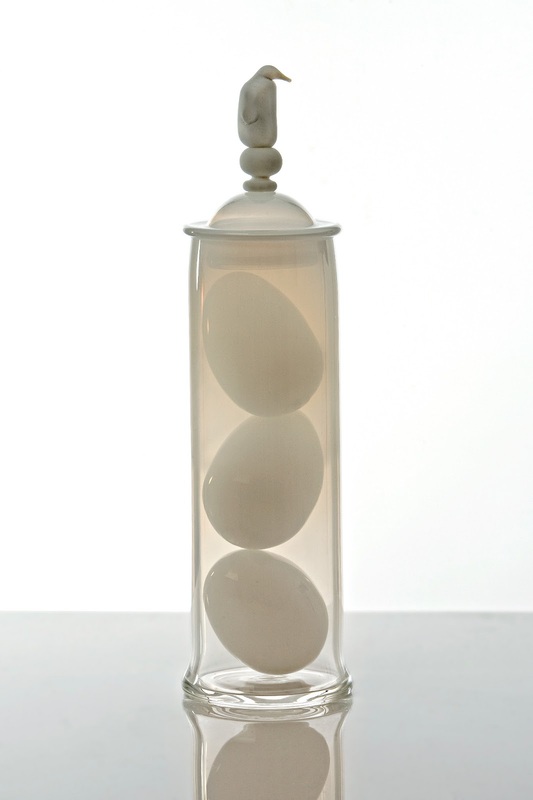 Colin Rennie has worked with glass as a material for sculpture since 1992. He developed a love of glassblowing and cold glass working while at Edinburgh College of Art. He currently teaches at the University of Sunderland where he runs the BA Hons Programme in glass and ceramics, and also at the University of Wolverhampton and Sars Potteries, Musee atelier du Verre In France. In that time his work has achieved recognition in major collections and competitions, including the Victoria and Albert Museum London, Ebletoft Glass Museum Denmark, Hsin-Chu Municipal Glass Museum, Taiwan, Ernsting Stiftung Glasmuseum Germany, and nomination for the Jerwood prize for glass. 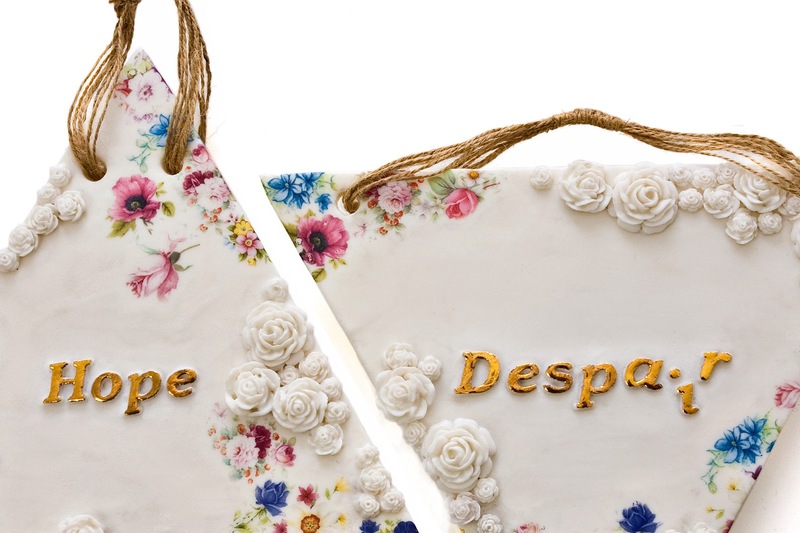 Novie Trump is a DC based sculptor and installation artist working primarily in ceramic and mixed media. Formally trained in classical archaeology at the University of North Carolina, her work has been selected for juried and invitational exhibitions in the US and Europe and has been featured in numerous publications. Winner of the Strauss Fellowship, she has been awarded numerous grants and commissions for several public art works, the most recent at the National Institutes of Health in Washington, DC. She has served on several nonprofit boards of arts organizations, currently she serves as the Chair of the Distinguished Artist Series for the James Renwick Alliance. Erwin Timmers is Co-founder and Director of the Washington Glass School and one of the DC area’s leading ‘eco-artists’. Recycling, waste, the environment and how they relate to society are recurring themes in his work – and, as an educator, Erwin has developed a number of courses that integrate ecological sustainability into the program. His work featured in various prominent collections and has received commissions from numerous commercial enterprises, such as Starwood Urban, The United States EPA Headquarters, Maryland’s Prince George’s County Courthouse and the US Library of Congress. 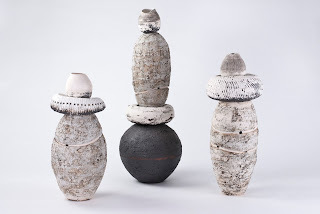 Dr Andrew Livingstone holds a BA(Hons), MA and a PhD, The Authenticity of Clay and its Redefinition within Contemporary Practice: Ceramic Familiarity and the Contribution to Expansion. He is an academic at the University of Sunderland where he leads both MA Ceramics and CARCuos the Ceramic Arts Research Centre. 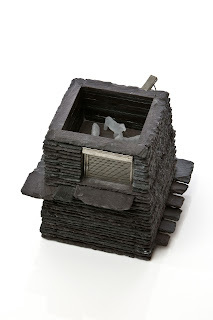 He recently exhibited in ‘Red Hot’ an exhibition of clay in contemporary art in Germany together with Ai Weiwei and Richard Deacon. 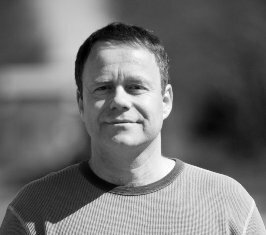 His research area is focused on ceramics in the widest sense engaging with material, process and the social contexts in which ceramics operate. The familiarity of ceramic material and object take center stage within his research, where both the handmade and ready made are employed within both installation and conceptual applications. Andrew’s work operates within the expanded field of ceramics and investigates the employment of and interface between digital media, film, animation, photography and non-ceramic intervention. Jeff Herrity had along career in Internet marketing helping non-profit organizations integrate offline and online communications, including membership and donor development fundraising efforts. 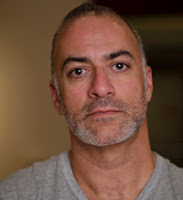 After 15 years in the industry, Jeff decided to change paths and pursue art and art education at the Corcoran College of Art+Design, where he graduates May 12, 2012. His work currently explores the relationships we create in a give-and-take marketing driven culture. 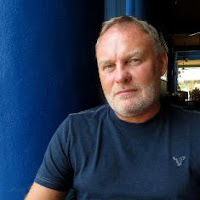 Professor Brian Thompson is Associate Dean of Faculty of Arts, Design & Media at the University of Sunderland. He has been awarded numerous prizes including: the Norwich School of Art Fellowship, the Pernod prize and the Peter Stuyvesant Art prize.From a background in fine art, he maintains a continuing practice in sculpture and drawing, exhibiting his work. 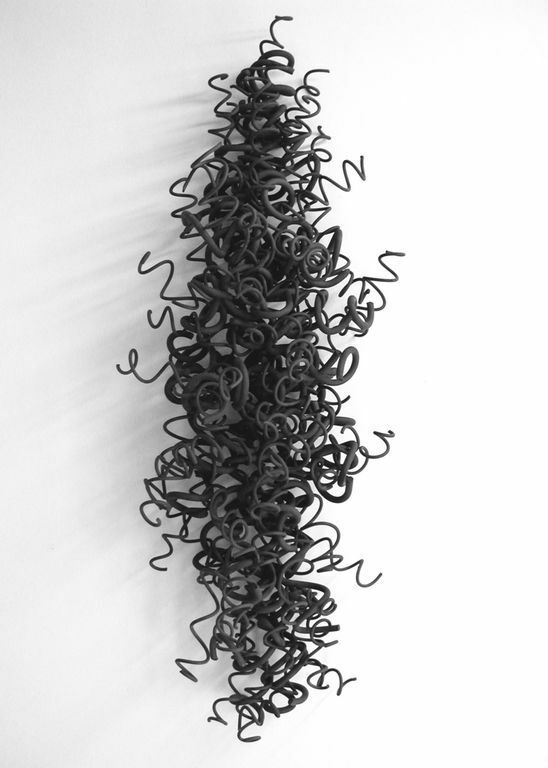 Brian’s sculptures reference how journeys explore landscapes, how paths get worn, compress and build up over many generations; how rivers cut and change course as they journey to the sea. These routes and points where they cross reveal the topography of the world and tell us something about how we come to know and navigate in nature. Phil Vickery is an international award winning glass artist who is based in the North East of England. 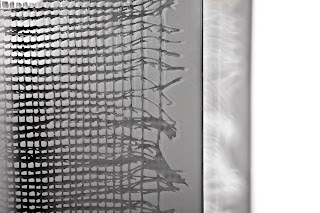 Phil was awarded the Renwick Award for Distinction in Glass in 2009, and in 2011 was chosen for one of five Honorary Diplomas of the Jutta Cuny – Franz Foundation, Germany. Most recently he was the winner of the Art In Lyddington award for best 3D in show, UK, 2012. His work involves two references concepts of thought, human nature, and the subconscious. 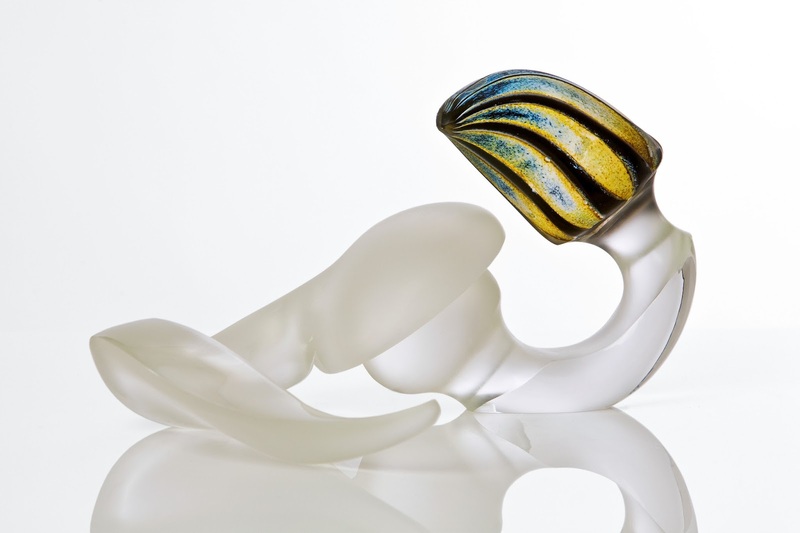 His technique showcases the process, movement and fluidity of glass; gathering over and over again to make the internal twisting more encased and to form an aesthetic of maelstroms in water.